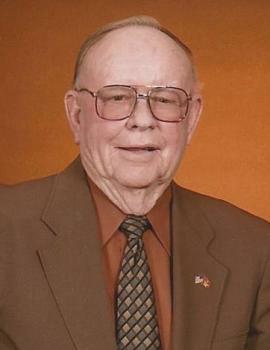 Grover C. (Bud) Wall Jr.
Grover C. (Bud) Wall Jr. , age 80, of LaRue, Ohio died Thursday December 6, 2012 at 5:40 PM at Heartland of Marion. He was born March 3, 1932 in southern Ohio to the late Grover C. and Cleo Louzetta (Veon) Wall Sr. On November 22, 1953 he married Donna LaVerne Kale and she died December 4, 2007. He is survived by one daughter; Diana (Bob) Janke of Marion and one son; Jeff (Suzy) Wall of LaRue. Grandchildren; Justin (Jodi) Wall of LaRue and Tyler (Brittany) Wall of Marion. Great Grandchildren; Jordan, Jocelyn, Payton and Gunner Wall. Sister; Irma Lou (Richard) Field of Marion. Special friend Pauline Kale. Bud was a farmer and also was a realtor in Marion for 20 years. He served in the U. S. Marine Corp. during the Korean Conflict. Member of the LaRue United Methodist Church, the Phillippi Clement Post 101 American Legion of LaRue, Marion County Farm Bureau. He was a hospice volunteer and enjoyed farming with his son and grandsons. Funeral Services will be held Monday December 10, 2012 at 11:00 AM at the LaRue United Methodist Church. Minister will be the Rev. Edward W. Fugate. Burial in the LaRue Cemetery. Friends may call at the Stofcheck-Ballinger Funeral Home in LaRue on Sunday from 2 to 5 PM. There will be graveside military rites conducted by the Marion County United Veterans Council. Those who wish may make contributions to either the Marion General Hospice or the LaRue United Methodist Church. Our Condeolences and Prayers to Jeff & Suzy, Justin & Jodi, Tyler & Brittany Wall Families. Please accept our heartfelt condolences on the loss of your loved one. We sure are going to miss seeing Bud drive by and the wave we always got from him each time. He has been a great neighbor. Dean and I would like to extend our deepest sympathy on the loss of Bud. I look at the date of Donna's passing and think she just missed him too much and the Good Lord eased her and Bud's pain. Now they are reunited almost five years to the day. I would find solace in that, hope all of you do too. Our thoughts and prayers go out to you at this sad time. Tyler, my thoughts and prayers are with you and your family during your time of loss. Lisa L.
To the family of Bud. Our thoughts are with you at this time of loss. His presence in the community cannot be replaced. May memories of the past bring ease to the future. you have our deepest sympathies on Bud's passing. Our thoughts & prayers are with you. He was such a great guy - he will be really missed by all. Sorry for your loss. I worked with Bud at Ron's Realty. We are sorry to read of Bud's passing, we haven't seen him for a long time. Ralph is a cousin to Donna, and we miss the Kale family, I was Frances Dilsaver and was a class behind Irma Lou. So sorry for your loss. We are so sorry for your loss Our thoughts and prayers are with the family at this time. We were renters of Bud and Donna in Larue. We enjoyed knowing them both, they were wonderful people. Another icon gone from our little town. So sad the changes are. Wonderful memories of Bud and Donna though and nobody can take that from any of us. Love you guys so very much. Doesn't matter what you need....just call. I saw Bud with Bill Gracely at Coonies just a few months ago. I was sorry to hear of his passing. Donna was so special to me and I knew him well through her. May God bless all of you as you celebrate his life.